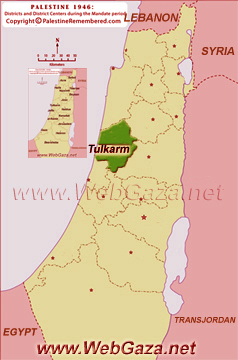 District of Tulkarm (Tulkarem) - Where Was The District of Tulkarm? One of the Palestine Districts 1948, find here important information and profiles from District of Tulkarm (Tulkarem). Where Was The District of Tulkarm (Tulkarem) Located? District of Tulkarm is located in the north part of Palestine 1948, north of Jaffa District, south of Haifa District, as shown on the map. Al Dardarah located 7.4 miles SW of Tulkarem. Population: 145. Obliterated in 1948, with the Jewish kibbutz Eyal built on its 930 acres. Ghabat Kufr Sour located 10.5 miles SW of Tulkarem. Population: 740. Obliterated in 1948, with the Jewish settlements of Bet Yeshoshua, Tel Yizhao and Kefar Netter built on its 4,917 acres. Al Jalamah located 6 miles NW of Tulkarem. Population: 70. Obliterated in 1948, with the Jewish settlement of Ahiyuv built on its 1,928 acres. Al Majdal/Tulkarem located 2 miles NNW of Tulkarem. Population: 75. Obliterated in 1948, with the Jewish settlement of Sed Yzhao built on its 139 acres. Al Manshiyyah/Tulkarem located 8 miles NW of Tulkaram. Population:260. Obliterated in 1948, with the Jewish settlements of Omez and Hamap’il built on its 4,192 acres. Miskha located 9.3 miles SW of Tulkarem. Population: 880. Obliterated in 1948, with the Jewish settlement of Ramat Ha Kosvesh built on its 2,019 acres. Al Mughayyer located 3 miles west of Tulkarem. Population: 75. Obliterated in 1948; all its lands were stolen. Qaqoun located 4.3 miles NW of Tulkarem. Population: 1,970. Obliterated in 1948, with the Jewish settlements of Gan Yoshiyyah and Ha’ogen built on its 10,442 acres. Tubsur located 12.4 miles SW of Tulkarem. Population: 125. Obliterated in 1948; its 825 acres were stolen and added to the Jewish settlement of Raananna. Umm Khaled located 8.7 miles West of Tulkarem on the Mediterranean Sea. Population: 970. The village's 724 acres were stolen and incorporated into the Jewish city of Netannya after the village was blown up in 1948. Zalafah located 5 miles NW of Tulkarem. Population: 210. Obliterated in 1948; all its lands of 1,928 acres were stolen.